One day, a couple summers ago, I sat on a rock by the lake shore in Yellowknife and ate elk stew and bannock. 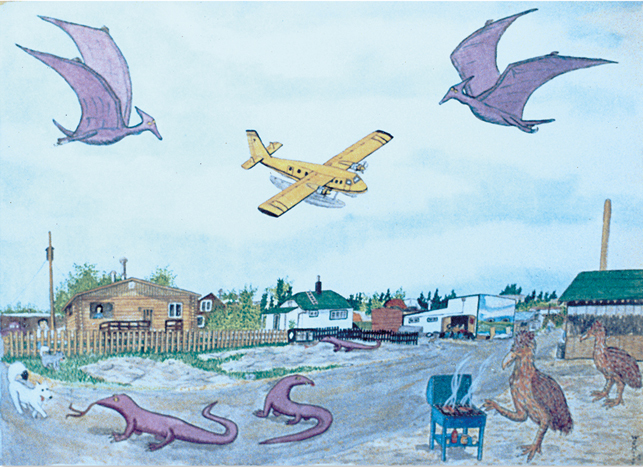 It was my dinner break during NARWAL’s dinner theatre, in which I performed a skit written by local playwright Ben Nind about a Norseman plane crash that happened around Great Bear Lake in 1942. As my scene partner and I performed on a floating dock, a Norseman bobbed in the water to our left. Meanwhile, set up with a canvas a foot away from the water, local artists Terry Pamplin and Jen Walden worked together to paint a scene of a yellow bush plane landing on the lake in front of us. The mythos of the bushplane, that has been steadily building since planes came north, had never been more obvious. It's not just an industry; it's a muse. Here's a taste of the art its inspired. 1. 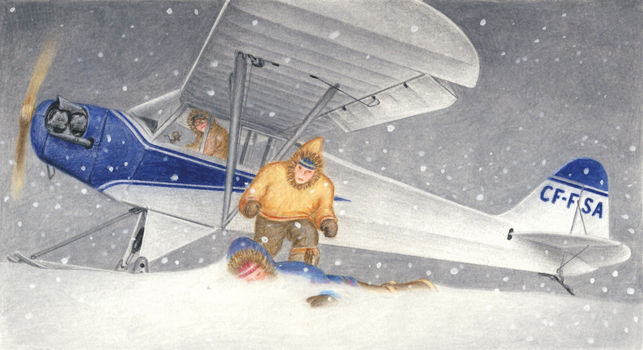 An illustration for "The Kuujjuaq Christmas Candy Drop", written by Linda Brand and illustrated by François Gauvreau. It depicts the true story of Johnny May saving a young girl from freezing to death in a Nunavik blizzard. 2. Designed by Dawn Oman and painted by the cast of Bushpilot. 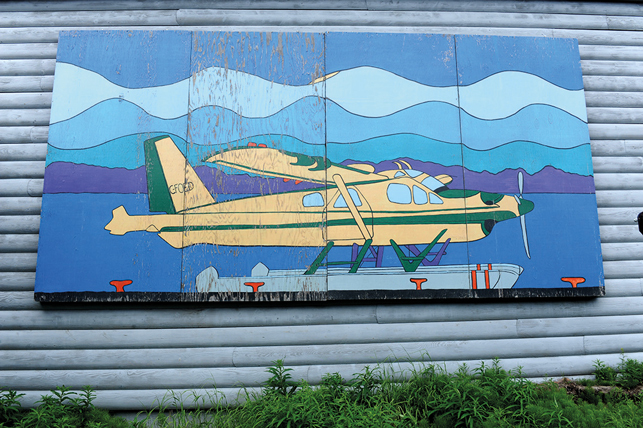 Find it on the back of The Gallery of the Midnight Sun in Yellowknife. 3. Walt Humphries re-imagines his surroundings in "Old Town Revisited." 4. Helene Girard's "The Silent Sentries of the Arctic." It took her 16 hours to paint the large tower in hundreds of lines in shades of white, blue and grey. 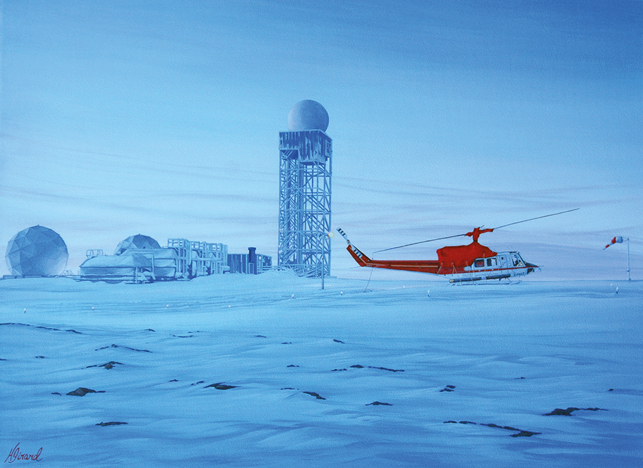 It depicts a maintenance visit on Christmas Day 2014 to a DEW line radar site southeast of Cambridge Bay—it was -52 C that day. 5. 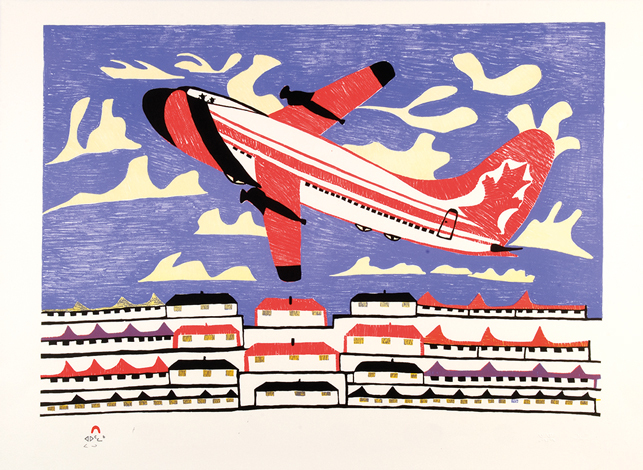 "Flight North," painted in 1989 by Pudlo Pudlat, a Cape Dorset-based artist who grew up on the land and died in 1992. 6. 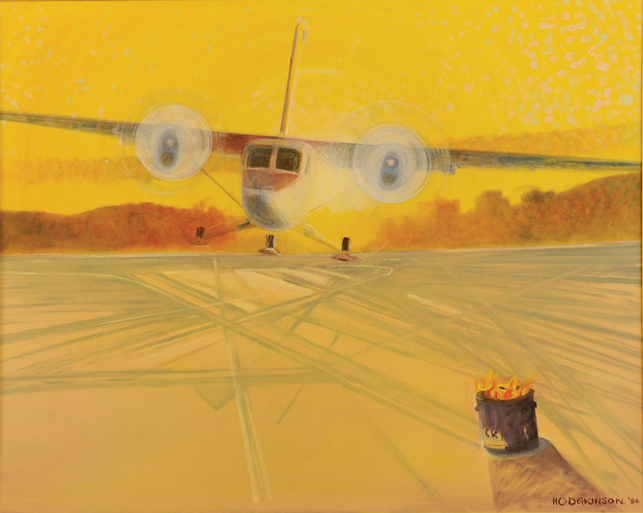 Sheila Hodgkinson's interpretation of a plane landing on a makeshift ice runway, a flare pot and the dusky light the only signs of warmth.